As Christian Disciples, we are called to a life of serving God and other people. You are not alone, but part of a larger body where each member is called to perform a serving function. By serving others as a Christian Disciple, it shows unity and solidarity to those outside of the church who frequently accuse the church of infighting and “devouring one another”. The Christian life is to be dynamic and active. The word “servant” is key in Scripture and is used at least 500 times in its various forms. When a Christian Disciple serves, God’s honour is released, and shows Jesus Christ’s beauty and glory, to those being served and to those watching. That is to be your motive for service. Serving is never to be about what you and I can get out of it. When that is the motive, God is not glorified. God’s glory and the total supremacy of Jesus over all things, is to be the goal in the life of all Christian Disciples. If you desire to grow spiritually, then serve! For spiritual growth comes from serving rather than you being served. This is because what you give in service of God and others, your faith grows and Jesus Christ gives back even more to you. Jesus speaking in Matthew 25v15-30 tells of the rewards for faithful service and the penalties for being faithless. When you serve others, it is a sign of your trust and faith in God. By serving, we reflect in some small way the greatest servant of all, Jesus Christ, who came to serve and give his very life for others (Mark 10v45). As a Christian Disciple, you are In serving others fulfilling the command that Jesus gave to love God and love others. Showing love and serving others achieves this aim of total obedience to Jesus. Salvation is not through Your Service! However a warning! Don’t be led into the trap of thinking that your service will lead to your salvation, as some will say. It will not! The only reason you have salvation, is because of the service of Jesus Christ, who was fully God and fully human. Your acts of service would never be able to pay that price, but your acts of service will help point others to Jesus, who paid the price for your salvation and others. So as you go from here, go to serve others and by doing so, you will also be showing your service to Jesus Christ your Master. Thank you. G’day and welcome to WISE. The word for today is “fellowship”. I meet people who tell me they are Christians, but don’t want to go to a church anymore. But by not doing so, they are missing out on perhaps one of the greatest blessings of being a Christian: fellowship. One of the great things about belonging to a church is the act of fellowship, which results from walking with one another (1 John 1v7). God has created us for fellowship and Jesus Christ has redeemed us so that we can have this fellowship together (Colossians 1v3-5). What is fellowship? This is rooted in the words koinōnia and koinōneō, which is a mutual sharing together, and not merely a mutual association. Fellowship is both in having fellowship and giving fellowship. Why fellowship? When Christian disciples fellowship with each other, God is glorified as a result (Romans 15v7). It is as a collective body that the Church fellowship grows in grace and maturity together, overcoming by grace, the weaknesses of each individual member (Ephesians 4vv12-16). You are commanded to continue meeting others for fellowship, so that mutual encouragement “toward love and good deeds” can take place (Hebrews 10v25)! By this you can live a consistent godly life, particularly if sins are confessed to each other (James 5v16)! Victory is also seen in the eyes of a fellowship, rather than singular individuality (1 Corinthians 15v57; 1 John 5v4). Whilst God deals with us as individuals, it is through fellowship that God strengthens you, for you are supported, healed and compensated by other Christians. These are all very good reasons why Christians need to find a Church to attend! How do we fellowship? Biblical fellowship sees the church having common purpose (Psalm 133v1-3), belief (Acts 2v42), hope (Hebrews 11v39-40) and needs (2 Corinthians 8vv1-15). Just as Christians have fellowship with the Father (1 John 1v3), Jesus (1 Corinthians 1v9) and the Holy Spirit (Philippians 2v1), so do they have with each other (1 John 1v7). The things a fellowship shares are, but not limited to, possessions (2 Corinthians 8v4), sufferings (Philippians 3v10) and the Gospel (Galatians 2v9; Philippians 1v5). By participating in His suffering and having fellowship with Jesus through his own sufferings, Paul was able to enter a deeper relationship with Jesus. How have you enjoyed fellowship this week and how will you enjoy it in the week to come? If you have found this resource helpful to you, please do prayerfully consider donating £1. 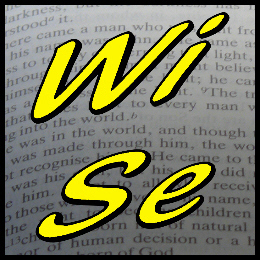 Gday and welcome to WISE! The word for today is Angel. Bookshops are filled with books on Angels! But we must beware, for not all angels are good! We know from the Bible that there are good angels and bad angels. Hebrews 1v14 tells us that they serve humans who are inheriting salvation! They appear in human form, as in Abraham’s visitor (Genesis). Whilst they are genderless, they invariably when appearing to people have masculine names such as Michael and Gabriel. They do not die (Luke 20v36), or marry (Mark 12v25). Being personal and intelligent, they communicate with humans. They have a will (2 Peter 2v4), are separate from humanity (1 Corinthians 6v3) and powerful yet also finite. There are large companies of angels (Revelation 5v11), which are organized into ranks! For example: Michael the archangel (Jude 9) and legions of angels (Matthew 26v53). God’s Angels constantly rejoice at God’s work (Revelation 5v11-12); and at a sinner’s conversion (Luke 15v10). Bad angels are often referred to as demons. The Bible says that some angels rebelled against God and were put out of heaven (2 Peter 2:4; Jude 6; Isaiah 14:12-15; Ezekiel 28). Their leader is satan who has established his kingdom on earth, and is the “god of this world” (2 Corinthians 4:4). They know Jesus and His authority and also know their eternal fate is destruction and torment (Matthew 8v29-31). Because of this, they want to take as many humans with them as possible. So they tempt humans to disobey God (Genesis 3); possess people (Mark 5) and give inspiration to false teachers (Galatians 1v8). They seek to hinder God’s program and hatefully oppose all God’s of work and God’s people (Mark 4:15; Job 2:4-5). How can we know the difference between good angels and bad angels? We listen to what they are telling us. If what they say is bringing all glory to God and to Jesus Christ, and they are always giving the glory to God, then they must be from God. If everything they say or do doesn’t match this standard, then they cannot be from God. Finally, the job of spreading the Gospel is not for angels. It is for Christian Disciples to do as commanded by Jesus (Matthew 28v18-20). God obviously thinks it is a much more efficient and effective method, than getting angels to do it! That method involves you – going to tell somebody else the glorious message of salvation through Jesus Christ alone.